*Indicates adrenergic prescription drugs in the top 200 for 2005. Figure 16.1 • Adrenergic neurotransmitters and related compounds. A quinone analog Figure 16.2 • Oxidation of Epinephrine (E). Diffusion and metabolism Figure 16.3 • Model of life cycle of NE. 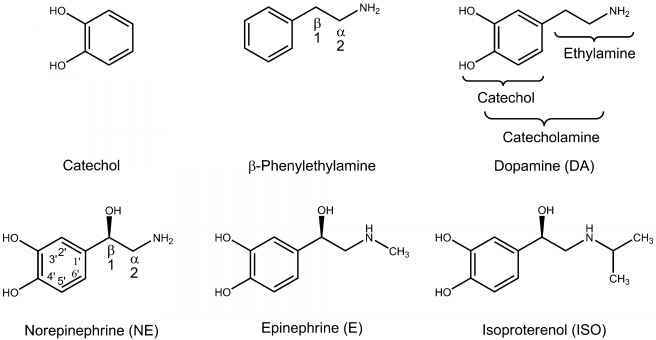 Figure 16.4 • Biosynthesis of the catecholamines dopamine, norepinephrine, and epinephrine. as competitive inhibitors of TH. a-Methyl-p-tyrosine (mety-rosine, Demser, Fig. 16.4) and its methyl ester have been the TH inhibitors most widely used to demonstrate the effects of exercise, stress, and various drugs on the turnover of CAs and to lower NE formation in patients with pheochromocytoma and malignant hypertension. TH is a specific phenotypic marker of CA-producing cells in the CNS and peripheral nervous system (PNS). The activity of TH is carefully controlled. For example, adrener-gic nerve stimulation leads to activation of a protein kinase that phosphorylates TH, thereby increasing its activity.3 In addition, through end-product inhibition, NE markedly reduces TH activity. The basis of this feedback inhibition is believed to be a competition between the CA product and the pterin cofactor. The second step in CA biosynthesis is the decarboxylation of l-DOPA to give DA, which is an important NT and a drug in its own right discussed in Chapter 13. The enzyme involved is DOPA decarboxylase. 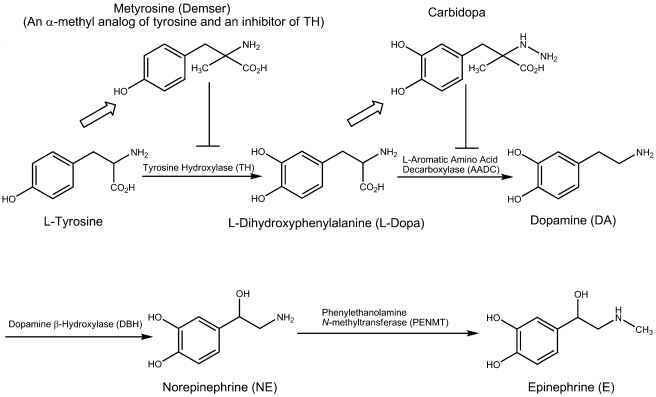 Although originally believed to remove carboxyl groups only from l-DOPA, a study of purified enzyme preparations and specific inhibitors demonstrated that DOPA decarboxylase acts on all naturally occurring aromatic L-amino acids, including L-histidine (precursor in the biosynthesis of histamine), L-tyrosine, L-tryptophan (precursor in the biosynthesis of 5-HT), and L-phenylalanine in addition to both l-DOPA and L-5-hydroxytryptophan. Therefore, this enzyme is more appropriately referred to as L-aromatic amino acid decarboxylase (AADC). In addition to being found in catecholaminergic neurons, AADC is found in high concentrations in many other tissues, including the liver and kidneys. 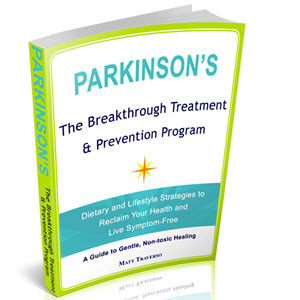 In simplest term, parkinsonism can be characterized as a DA deficiency in the brain. Thus, increasing brain levels of DA should ameliorate the symptoms. Unfortunately, direct parenteral DA administration is useless because the compound does not penetrate the blood-brain barrier (BBB). However, oral dosing with l-DOPA (levodopa, Dopar) could act as a prodrug because it entered the brain (on a specific carrier) and then was decarboxylated to DA there. l-DOPA is effective and decrease tremor and rigidity. Unfortunately, many adverse systemic effects were the result of the high doses needed to achieve the desired results. The main reason is the relatively higher concentration of AADC in peripheral system than in the brain. Inhibition of peripheral AADC activity by coadministration of at peripheral decarboxylase inhibitor such as carbidopa (charged at physiological pH), can markedly increase the proportion of levodopa that crosses the BBB. (see Chapter 13). The third step in CA biosynthesis is side-chain 3-hydroxylation of DA to give NE. DA formed in the cytoplasm of the neuron is actively transported into storage vesicles by a 12-helix membrane-spanning proton antiporter called the vesicular monoamine transporter (VMAT) and is then hydroxylated stereospecifically at the 3-carbon to NE inside the vesicle by dopamine 3-hydroxylase (DBH, dopamine 3-monooxygenase). The NE formed is stored in the vesicles until depolarization of the neuron initiates the process of vesicle fusion with the plasma membrane and extrusion of NE into the synaptic cleft. DBH has rather low substrate specificity and acts in vitro on various substrates besides DA, hydroxylating almost any phenylethylamine to its corresponding phenylethanolamine (e.g., tyramine to oc-topamine, a-methyldopamine to a-methylnorepinephrine). A number of the resultant structurally analogous metabolites can replace NE at the noradrenergic nerve endings and function as "false" NTs. The last step in CA biosynthesis is the N-methylation of NE to give E in the adrenal medulla. The reaction is catalyzed by the enzyme phenylethanolamine-N-methyltransferase (PNMT). PNMT is a cytosolic enzyme and the methyl donor S-adenosyl methionine (SAM) is required for the N-methyla-tion of NE. The adrenal medullary enzyme has rather low substrate specificity and transfers methyl groups to the nitrogen atom on various 3-phenylethanolamines. The reaction occurs in the cell cytoplasm, and the E formed is transported into the storage granules of the chromaffin cells. Although PNMT is mostly found in the adrenal medulla, low levels of activity exist in heart and mammalian brain. Regulation of this enzyme in the brain has not been extensively studied, but glucocorticoids are known to regulate the activity of PNMT in the adrenal gland. Storage and Release. A large percentage of the NE present is located within highly specialized subcellular particles (later shown to be synaptic vesicles but colloquially referred to as granules) in sympathetic nerve endings and chromaffin cells. Much of the NE in CNS is also located within similar vesicles. The concentration in the vesicles is maintained also by the VMAT. Following its biosynthesis and storage in granules, the entrance of Ca2+ into these cells results in the extrusion of NE by exocytosis of the granules. Ca2+-triggered secretion involves interaction of highly conserved molecular scaffolding proteins leading to docking of granules at the plasma membrane and then NE is released from sympathetic nerve endings into the synaptic cleft, where it interacts with specific presynaptic and postsynaptic adrenoceptors, on the effector cell, triggering a biochemical cascade that results in a physiologic response by the effector cell. Indirectly acting and mixed sympathomimetics (e.g., tyramine, amphetamines, and ephedrine) are capable of releasing stored transmitter from noradrenergic nerve endings by a calcium-independent process. These drugs are poor agonists (some are inactive) at adrenoceptors, but they are excellent substrates for VMAT. They are avidly taken up into noradrenergic nerve endings by NE reuptake transporter (NET) responsible for NE reup-take into the nerve terminal. In the nerve ending, they are then transported by VMAT into the vesicles, displacing NE, which is subsequently expelled into the synaptic space by reverse transport via NET. Their action does not require vesicle exocytosis. Uptake Once NE has exerted its effect at adrenergic receptors, there must be mechanisms for removing the NE from the synapse and terminating its action at the receptors. 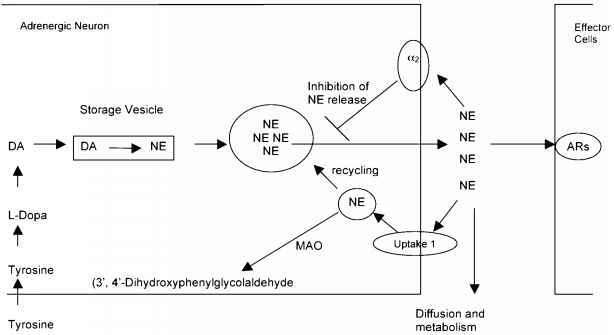 These mechanisms include (a) reuptake of NE into the presynaptic neuron (recycling, major mechanism) by NET and into extraneuronal tissues, (b) conversion of NE to an inactive metabolite, and (c) diffusion of the NE away from the synapse. The first two of these mechanisms require specific transport proteins or enzymes, and therefore are targets for pharmacologic intervention. By far, the most important of these mechanisms is recycling the NE. This process is termed uptake-1 and involves a Na+/Cl~-dependent transmembrane (TM) NET that has a high affinity for NE.4 This reuptake system also transports certain amines other than NE into the nerve terminal, and can be blocked by such drugs as cocaine and some of the tricyclic antidepressants (see Chapter 15). Similar transporters, dopamine transporter (DAT) and serotonin transporter (SERT) are responsible for the reuptake of DA and 5-HT (serotonin), respectively, into the neurons that release these transmitters. Some of the NE that reenters the sympathetic neuron is transported from the cytoplasm into the storage granules carried out by an H+-dependent TM VMAT.5 There, it is held in a stable complex with adenotriphosphate (ATP) and proteins until sympathetic nerve activity or some other stimulus causes it to be released into the synaptic cleft. Certain drugs, such as reser-pine, block this transport, preventing the refilling of synap-tic vesicles with NE and eventually cause nerve terminals to become depleted of their NE stores. By this mechanism, re-serpine inhibits neurotransmission at adrenergic synapses. In addition to the neuronal uptake of NE, there exists an extraneuronal uptake process, called uptake-2 with relatively low affinity for NE. Although its physiological significance is unknown, it may play a role in the disposition of circulating CAs, because CAs that are taken up into extraneuronal tissues are metabolized quite rapidly. Metabolism. The second mechanism of CA removal is metabolism. The major mammalian enzymes of importance in the CA metabolism are monoamine oxidase (MAO) and catechol-O-methyltransferase (COMT).6,7 The comparison of the two enzymes is shown in Table 16.2. Both E and NE are orally inactive and have short durations of action because of their high hydrophilicity, ionization, and extensive first-pass metabolic deactivation by COMT and MAO. The lack of substrate specificity of COMT and MAO is manifested in the metabolism of NE and E, shown in Figure 16.5. Not only do both MAO and COMT use NE and E as substrates, but each also acts on the metabolites produced by the other. Drugs that are catechols are subject to metabolism by COMT, whereas drugs with unsubsti-tuted or secondary N-methyl-amino amino groups are often substrates for MAO. The first enzyme of importance in the metabolism of CAs in the adrenergic neurons of human brain and peripheral tissues is MAO. MAOs oxidatively deaminate CAs to their corresponding aldehydes, which are rapidly oxidized to the corresponding acid by the enzyme aldehyde dehy-drogenase (AD). In some circumstances, the aldehyde is reduced to the glycol by aldehyde reductase (AR). For example, NE is deaminated oxidatively by MAO to give 3',4'-dihydroxyphenylglycolaldehyde (DOPGA), which then is reduced by Ar to 3',4'-dihydroxyphenylethylene glycol. It is primarily this glycol metabolite that is released into the circulation, where it undergoes methylation by the COMT that it encounters in nonneuronal tissues. The product of methylation, 3'-methoxy-4'-hydroxyphenylethylene glycol, is oxidized by alcohol dehydrogenase and AD to give 3'-methoxy-4'-hydroxymandelic acid. This metabolite commonly is referred to as vanillylmandelic acid (VMA), and is the major end product of several pathways of NE metabolism. An estimate of CA turnover can be obtained from laboratory analysis of total metabolites (sometimes referred to as VMA and metanephrines) in 24-hour urine sample. In the oxidative deamination of NE and E at extraneuronal sites such as the liver, the aldehyde formed is oxidized usually by AD to give 3,4-dihydroxymandelic acid (DOMA). MAO inhibitors (MAOIs) prevent MAO-catalyzed deami-nation of NE, DA, and 5-HT following their reuptake into the nerve terminal from the synaptic cleft. As a result, higher concentration of the NTs will be stored in the vesicles and become available for release from the presynaptic terminals on demand. 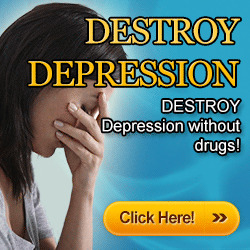 Antidepressants such as phenelzine (Nardil), isocarboxazid (Marplan), and tranylcypromine (Parnate) are MAOIs. There are two types of MAOs, and these exhibit different substrate selectivity.8 MAO-B primarily metabolizes DA and thus MAO-B inhibitors would tend to preserve brain DA and be effective by themselves and/or potentiate levodopa. Selegiline (Eldepryl) is a specific type MAO-B inhibitor and does extend the duration and increase the efficacy of levo-dopa. The drug is promising, probably as an adjunct to levo-dopa or in levodopa refractory patients. The understanding of CAs metabolism can be important in the management of certain drug therapies and may even aid in diagnosis. 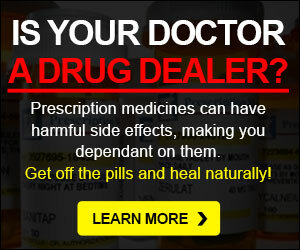 For example, changes resulting from drugs may indicate the success of a treatment. The cerebrospinal fluid (CSF) levels of methylhydroxyphenylglycoaldehyde (MOPEG) are indicative of Ne levels. Just as they can be related to the intensity of depression, the degree of improvement expected with antidepressants can be monitored in the weeks it may take before the clinical symptoms improve. A CSF level of homovanillic acid (HVA, the major metabolite of brain DA, which is a counterpart of end metabolite of NE) is understandably low in parkinsonism.